Viriginia Patterson is currently a realtor-associate with Cass, Inc Realtors’ Agency in West Orange, NJ. She has been a licensed agent and insurance broker for over forty years. She also holds active memberships in other community organizations. She was a charter member of the Grove Street Senior Citizens’ housing Corporation Inc., that developed Bailey Holt Tower in 1983, a 128-unit senior citizen residence in East Orange, New Jersey. 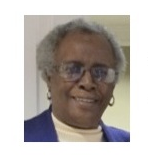 Virginia has also served as Commissioner on the board of the East Orange Housing Authority for over twenty years. She has a master’s degree in Education and Business Administration from Seton Hall University. A retired educator in the public school system, she is a graduate of Upsala College with a Bachelor of Arts Degree in Accounting and Business Administration.